April 30, 2012 - The next-generation engine that will help carry humans deeper into space than ever is back, bigger and better. The J-2X engine is currently on the A-2 Test Stand at NASA's Stennis Space Center in Mississippi for an extensive round of tests to build on last year's successful test firings. The engine will provide upper-stage power for NASA's evolved Space Launch System (SLS), a new heavy-lift rocket capable of missions to deep space. "We're making steady and tangible progress on our new heavy-lift rocket that will launch astronauts on journeys to destinations farther in our solar system," said NASA Administrator Charles Bolden, who recently visited Stennis and saw the J-2X in its test stand. "As we continue test firings of the J-2X engine and a myriad of other work to open the next great chapter of exploration, we're demonstrating our commitment right now to America's continued leadership in space." The space agency conducted an initial round of sea-level tests on the first developmental engine last year. This second test series will simulate high-altitude conditions where the atmospheric pressure is low. The SLS will use J-2X engines on the second stage of flight after the first stage is jettisoned. "The first round of testing helped us get to know the engine, how it operates and its basic performance characteristics," said Tom Byrd, J-2X engine lead in the SLS Liquid Engines Office at NASA's Marshall Space Flight Center in Huntsville, Ala. "Now, we're looking forward to testing J-2X in the SLS flight configuration, collecting nozzle data and continuing to learn about the performance of the engine itself." NASA has worked closely with the J-2X prime contractor, Pratt and Whitney Rocketdyne of Canoga Park, Calif., to prepare the J-2X engine, dubbed E10001for its second round of tests. The J-2X engine nozzle is different from the nozzle used on the space shuttle main engine for the last 30 years of space missions. While the space shuttle main engine nozzle was hydrogen cooled to save weight, the J-2X hydrogen-cooled nozzle is shorter and attached to a lightweight, passively cooled nozzle extension. A total of 16 tests are scheduled, tentatively beginning this Wednesday. They are expected to conclude by the end of this year. In its first round of testing, the J-2X engine reached 100 percent power in just four tests and achieved a full flight-duration firing of 500 seconds in its eighth test, faster than any other U.S. engine. The engine was fired a total of 10 times for a cumulative 1,040 seconds of testing various aspects of performance. The J-2X is a redesign of the heritage J-2 engine that helped send astronauts to the moon during the Apollo Program in the 1960s and 1970s. In addition to testing the engine, NASA is conducting tests on the J-2X powerpack, which includes the gas generator, oxygen and fuel turbopumps, and related ducts and valves. 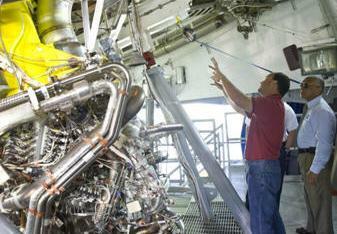 Tests of the powerpack components are being conducted on the A-1 Test Stand at Stennis. The J-2X is being developed for NASA by Pratt and Whitney Rocketdyne. It is the first new liquid oxygen and liquid hydrogen rocket engine developed in 40 years that will be rated to carry humans into space.